One of the biggest problems and best kept secrets of all origin of life researchers is the problem with chemical reactions that do not occur in the nonliving world yet are required by the living world. Such biochemical reactions simply do not occur in nature, anywhere or at any time, under any circumstances but require living systems that are fully in place. Life cannot come into being by natural methods. In other words, there are some chemical reactions that just do not occur under any conceivable nonliving conditions but which are required to have occurred if life is the product of natural means. 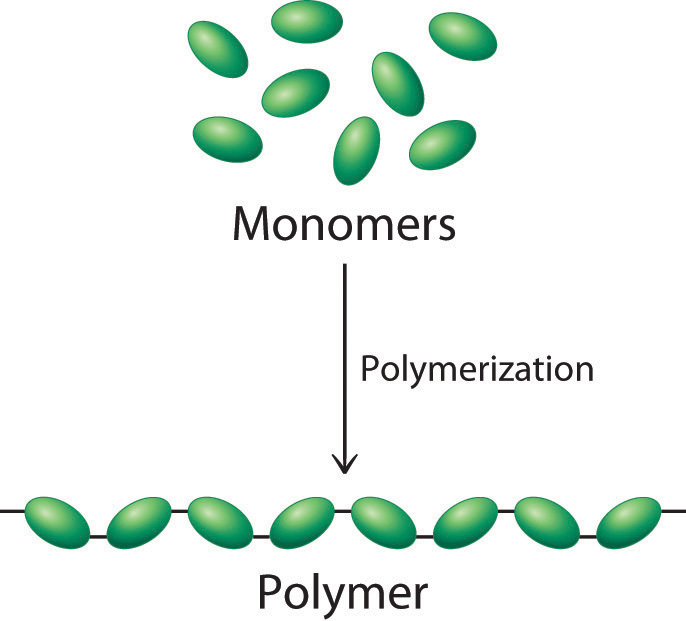 Of the many biochemical reactions needed for life to proceed, the reactions required to form linear polymers cannot be shown to occur naturally. Many argue that earth’s oil reserves exist because of the death of once living beings. Because oils represent polymers of methane in long linear and branched chains, the reserves must be limited since they are proposed to be the product of the death and decay of once-living microscopic organisms. This is why oil is called a fossil fuel. The idea suggests that the oils and fats and other complex organic polymers made by living things must have accumulated on ancient ocean floors. These were then compressed under heat to form organic chains of saturated and unsaturated organic polymers which we can separate into gasoline, kerosene, and other oils and tars. BELOW: THE STRUCTURES OF SOME ORGANICS THAT COME FROM OIL. A much greater problem arises when one looks at the polymers of living organisms. DNA, RNA, and proteins are linear polymers. They have no branching and are formed by the enzymatic catalysis of monomeric units. 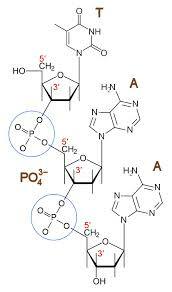 For DNA and RNA the monomers are only 4 types of nucleotides for each polymer. 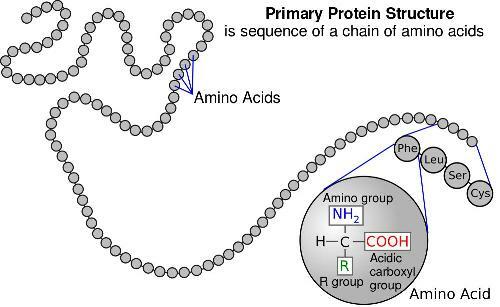 For proteins, these long chains of polymeric compounds are made up of 20 different amino acids. Forget for a moment that the arrangement of these monomers must be in a precise linear order to contain information for biology to proceed. Let’s tackle one problem at a time. The first problem is to get monomers to undergo molecular bonding in precise ways to form a linear polymeric chain. For the amino acids, the peptide bond involves the condensation of carboxyl groups with the nitrogen of the amino terminal of another molecule. Though the 20 amino acids have unique side chains that could also undergo reactions, for a linear chain of polypeptides to form only the amino group of one monomer must be involved with the carboxy group of another monomer. Anything else creates something often called proteinaceous but certainly not functional proteins. ABOVE: IS THE LARGE POLYMER OF AMINO ACIDS; A PROTEIN OR POLYPEPTIDE CHAIN. BELOW IS THE SINGLE REACTION THAT MUST TAKE PLACE REPEATEDLY BETWEEN AMINO ACIDS TO CREATE THE CHAIN OF MONOMERS WE CALL PROTEIN. 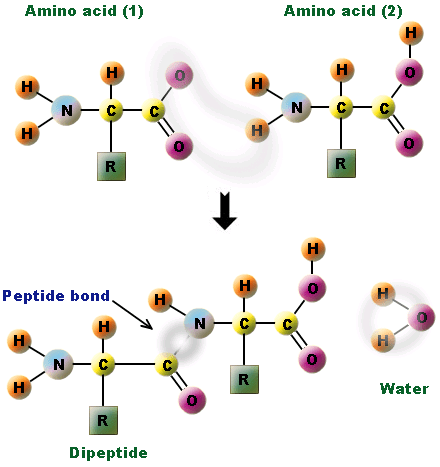 IT IS CALLED THE PEPTIDE BOND. For DNA to form, the number 3 sugar carbon of the sugar-phosphate group of one monomer (nucleotide) must bond to the number 5 sugar carbon of the sugar-phosphate group of a second monomer through a phosphate group shared between the two monomers (see drawing below). No other bond will give rise to the 5 prime-3 prime sugar phosphate backbone that is paramount to forming a polynucleotide chain. ABOVE: SEVERAL NUCLEOTIDE SUGARS CONNECTED THROUGH THE PHOSPHATE GROUP TO FORM THE 5′-3′ SUGAR-PHOSPHATE BOND FOR NUCLEIC ACIDS LIKE DNA. BELOW: A SIMPLER DIAGRAM OF THE SAME POLYMERIZATION REACTION.